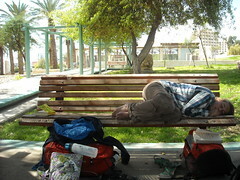 Wednesday morning (March 6) Jake, Hilary, Lydia, and I walked to the Jerusalem central bus station and each purchased a ticket for bus #444 direct to Eilat. We departed promptly at 10 a.m., and with the help of our daredevil bus driver, we were looking out at the Red Sea at 2 o’clock that afternoon, an hour earlier than projected. I had pulled up a walking route on google maps on the bus, using the complimentary wifi provided on the Egged public transport bus. Unfortunately, the map disappeared the minute we walked off the bus and away from the wifi, so we walked out of the bus station without a map. Luckily Jake, who had been planning on finding his own transportation to Eilat, was with us and had his own hand drawn map of the route from the bus station. We followed it as best as we could until we felt sufficiently lost and hailed a cab. We landed at a gated corner house that matched the address we found on the website. Success! But when we rang the bell, no one answered. We realized that our hosts were probably not expecting us for another hour, so we camped out on the steps in front of the gate and read for an hour, maybe an hour and a half. At 4:00 we decided we should try something else. Jake and I found a neighbor and asked to use his cell phone to call our host, but as we were dialing, the neighbor-man told us that the number we had was not an Israeli number. In fact it was not a cell phone number at all. “Who are you trying to call?” he asked. “Violette? Yes, she lives here, but she is at work, and her husband works at the U.N. She will be home later tonight.” Three phone calls and several trips to a nearby falafel stand later we were in our apartment. We spent the next week sleeping in, reading, lounging on the beach, snorkeling at Coral Beach, and visiting a tourist trap called the Ice Mall where we saw some amateur figure skating. All in all a good week, but we were happy to arrive at Ecce Homo on Sunday night, where we knew our meals would no longer consist of hot dogs, tomato paste, and canned peas. 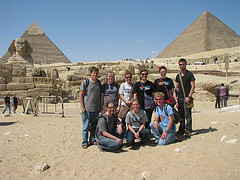 the pyramids at Giza, the Sphynx, the Egypt museum of Cairo, the (modern) library of Alexandria, and stayed at Anafora, a Christian retreat center. We had a great mix of excitement and relaxation: discomfort crammed in a hot, stinky van for way too long, followed by super-comfort, relaxing and reading in a desert oasis. We were on the edge of our seats as we rode through the Bedouin Sinai accompanied by a convoy of soldiers, then again at the edge of our seats as we waited for our food at a delicious restaurant on the coast of Alexandria. I think that every one of us in the Egypt group grew in our ability for trust, flexibility, and wonder at the uniqueness of the world we live in. Linford likes to talk to us about the risk-taking life of Jesus, pushing the boundaries in order to show the immensity of God’s love. What greater way to appreciate God’s creativity and goodness than to step outside our comfort zones and experience a brand new culture? What a very different week! Adventurous, scary and exciting are some of the words people used to describe this week. My group consisted of Rachel, Elise, Erin, Victoria, Megan and myself. We traveled to the city of Haifa right on the Mediterranean Sea for a week of relaxation. Some of the amazing activities that filled this week were creating a homemade projector to watch movies off our iPods (it definitely worked), eating lots of food, (some good, some different) lots of sleeping, laying on the beach, eating at a restaurant where they spoke little English, basically just Hebrew, and just enjoying God’s wonderful world. This was such an amazing and thrilling week where we got to relax, but also get to know each other a little better. Even though it was sad to end this great week, I think we will all be excited to finish up the last part of our semester abroad. May God bless us with a good finish and with peace along the way. Peace be with you all! Jake B-S, Mark, Jacob and I spent two days sailing the Mediterranean Sea. 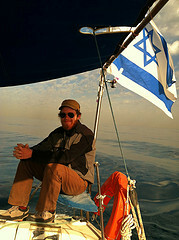 We sailed up the Israeli coast from Askqelon to Jaffa the first day. The sea was pretty rough so we all had less than enjoyable experiences. The second day was much better, though. We sailed back to Ashqelon and enjoyed the time talking and reading. The water was much more smooth the second day. After sailing, Jacob, Mark, and I travelled to Haifa for four days. While there we visited the Baha’i Gardens and had a relaxing day on the beach. We also walked around the city a little and enjoyed exploring this coastal city. We did have to survive on hot dogs and instant noodles but we managed. Free travel with Nate Bailey, Joseph Arbaugh, and Isaac King was nothing less than adventurous! We all braved the salty Mediterranean Sea for a two day sailing trip. The waters were very calm and our trip was equally calm and relaxing. Most of the time was spent talking to our dynamic skipper, Reuben, who told us stories ranging from his service with the Israeli Navy to life on a kibbutz. We were even lucky enough to see breeching dolphins from our boat on the first day! This is definitely an experience to remember. We all met back together Sunday night (March 10) from our travels at Ecce Homo. Ecce Homo is a convent for the Sisters of Zion in the Muslim quarter of the Old City in Jerusalem. We spent the next day telling tales of our week travelling about (entertaining to say the least) and being introduced into the topic of Judaism, our study for the next week. 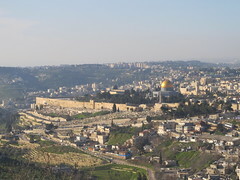 While on this subject we took about 10 hours of Hebrew (we can now sing the alphabet and pick out Hebrew letters), learned about the ancient and modern religion of Judaism, and followed Jesus through Jerusalem. It was to our surprise when one night Linford led us to a room down under Ecce Homo where there is an old Roman street. This is the street thought to be where Jesus was interrogated by Pilate. We spent the evening in quiet reflection on what Jesus did for us and ended it with some singing and scripture. Then on Friday, we followed the path Jesus took the week of his trial. From the Upper Room where the Last Supper took place to the Garden of Gethsemane, the place Peter denied Jesus, walking the Via Dolorosa (the traditional path where Jesus carried his cross to Golgatha) and ending at the Garden Tomb. It was a unique and humbling experience for us and with Easter approaching I believe we all became a bit more aware of what our Jesus did for us. This week was also entertaining in that we lived in the Old City with the Dome of the Rock and the Western Wall a couple of streets away. Most of us became experts at finding our way in and out of the crowds of people in order to explore and barter for gifts with the shopkeepers. It’s amazing how good you feel about yourself when you manage to save a few shekels. 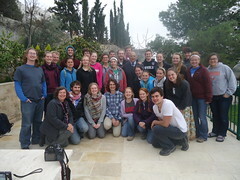 As much fun as we had at Ecce Homo we moved on to a kibbutz in the Galilee this past Sunday. We have spent this past week studying through Oranim College about the modern Israeli history. This has included talks with soldiers in the Israeli army, students from Oranim College, lectures and museums about the Holocaust and even being on the radio. These past two weeks have sped by quite quickly and we are once again packing up and moving on to Nazareth tomorrow afternoon. While we enjoyed our time in Jerusalem and on the kibbutz we are looking forward to the next leg of our journey: conquering the Jesus trail. This morning we all gathered, anxiously awaiting free travel, to take our final exam on Geography and Physical Settings of the Bible and to finish our lovely time that we have had over the past two weeks at Jerusalem University College. Once we finished the exam, we all celebrated and received certificates of completion of a wonderful program. (We hope they don’t get revoked once our exams are graded.) The past two weeks have been much fun and very busy for our group. We have traveled to almost all corners of Israel and learned about the Bible, geography and stories from history and modern time. Some of the highlights were exploring the Old City of Jerusalem and meandering our way through an underground pitch-black aqueduct that still had water in it, swimming in the Mediterranean Sea while we visited Ashquelon, playing in water falls while being watched by ibexes and rock badgers, and then crossing the street to float in the Dead Sea and to choke on some pretty salty water, and a four-day trip up to the Galilee. 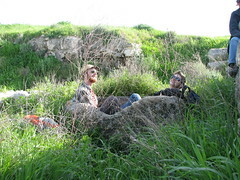 We stayed in Ein Gev while in the Galilee where we had our own private cabins right on the water’s edge. While we were in the Galilee, we went to Dan, where one of the country’s largest springs is, saw a massive water fall, found a temple that used to house dancing goats, and rode a boat across the Sea of Galilee. Although we are all very tired after these past two weeks and a lot fuller of knowledge, we are all really glad and feel fortunate for the experiences that we have been able to undertake. It has helped us all to go to the places where Biblical stories happened and to see the context for which they were written. It has let us gather a much deeper understanding of this land and the people who have been living here for thousands of years and what hardships and celebrations that they have as we have felt them too. This coming week, we split paths and go on free travel. We are going all over, including to Egypt, sailing on the Mediterranean Sea and spending time exploring Jerusalem further. Today is our last day in Beit Sahour, Palestine. We’ve been exploring the differences between “cold-culture” America and “hot-culture” Palestine, with a few mistakes and a lot of learning. Palestinians are an ideal model of how community should be lived out. We are all a little sad to say goodbye to our host families, but we are ready for the next adventure. Over the past three weeks, we all became familiar with our host families, the little town here and somehow managed to pass our Arabic classes. We heard many different lectures about Palestinian history, literature, culture. We heard from a Hamas representative in Palestinian Parliament, an expert in nonviolent resistance to the Occupation, an expert on the “Arab Spring” and an expert on Muslim-Christian relations. We have heard many stories from Palestinians of all ages and these stories will stay with us for the rest of our lives. We have truly been touched by the hospitality here and the laughter and hope Palestinians can still find while living under such oppressive conditions. Our group has also enjoyed many field trips. We spent some time at nearby Bethlehem University, touring the university, hearing a lecture about Palestinian Women’s Issues, and later enjoying a barbecue with the students. We also visited the city of Nablus and the largest university in the West Bank there. We toured Deheisha Refugee Camp and heard about refugee issues from an expert at Badil Center for Reguees. 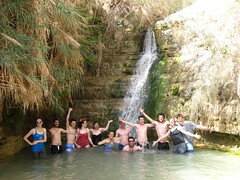 One of the favorite activities for most of us was hiking through the beautiful Wadi Kilt (Qelt) valley to the city of Jericho. Along the way, we explored a monastery and ancient Herodian ruins. Later we visited the castle Herodion and walked through the tunnels underneath the castle. 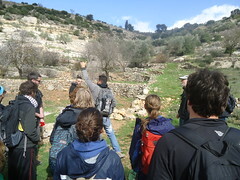 We also explored Solomon’s Pools, enjoyed a lecture from the Applied Research Institute and enjoyed one final hike in Palestine named an “eco-hike” from Beit Jalla to Bettir. Our time here has left us with many new stories to tell as well as an infinite amount of questions, frustrations and hopes. Our three weeks here in Palestine has only given us a glimpse of what it is like to live under military occupation with a nation of Israelis constantly trying to push you from your home. We haven’t answered all of our questions or frustrations, and we maybe never will, but we have all learned the power and comfort of prayer, communion with one another and the gift of laughter. Here are two poems that I (Nicole) wrote. The first was after spending a day in Hebron, with Israeli soldiers all around, and tons of checkpoints surrounding markets and people’s homes. Some soldiers were standing on top of abandoned houses, just watching people walk through their streets. There are 500 settlers living in this Palestinian city and 3000 Israeli soldiers. Green uniform. Green hat. Gun. Dark or white skin. Blue, brown, or green eyes. Soldier, do you believe in what you hold your gun for? I wonder if you see mine. And if you can see my humanity, do you see the humanity in the Palestinian man, woman, child, and grandparent walking beside me? Under your green hat, I see your dark eyes. Behind your big gun, You have a heart. I pray to God for you. For your heart. I pray that He grants you compassion. Why do you pretend to be so mean and tough? Is there guilt in what you do? There must be. Do you think it’s right for 3,000 of you soldiers to be in this Palestinian town? Are you really just protecting these 500 Israeli settlers? Security reasons. But this “security” scares and encroaches into people’s livelihoods. Soldier, ask why. I beg you. Please see with your eyes. in this ghost-town that your people caused. with the eyes of compassion such as Christ. It seems you are blinded by the militaristic values of your nation. This next poem is from a demonstration that Amanda Chandler, Michael Bodner, Andrew Nafziger and I went to. We were invited to go with a man named Dr. Qumsiyeh, who gave us a lecture on non-violent resistance. The demonstration was very interesting and sad. These farmers’ land has been declared a military zone by the Israeli government, so we went to show our support of the farmers. We witnessed many injustices and arrests. We also helped look for flowers because Dr. Qumsiyeh is collecting flora and fauna for a natural museum he wants to make. It was ironic to be looking for flowers while Israeli soldiers meanwhile were arresting innocent people for being on their own farmland. My land, our land. 80 villagers and others. My land. 10 Israeli jeeps. From the land comes demonstration. Crushed beneath the soldier’s boot. replies the blindness of the powers. Find the anger of the land. Find the struggle of the land. full of strength, growth, BEAUTY. Now we prepare to do something no EMU Middle East group has done before: we are staying three days with host families in a Jewish settlement built on illegally confiscated land. Settlements have become a symbol of all the oppression of the Palestinians; settlers are notorious for being the most extreme of Zionists. We are praying that we may connect with these people and see the common humanity in all just as Jesus did. Marhaba from Palestine! We arrived in Beit Sahour, Palestine about a week and a half ago after a lovely stay in Jordan. After a long time waiting to cross the Jordan-Israel border, we came into town late at night to be greeted by the Alternative Tourism Group and gracious host families that have taken us in with much hospitality and kindness. We spend our days visiting Biblical sites, seeing and hearing about life under occupation, and learning Arabic. And all three mix together in our thoughts and reflections. One of our first days out and about we spent in Bethlehem. We visited Shepherd’s Field where the angel appeared to the shepherds to tell them about the coming of baby Jesus and then we moved to the Church of the Nativity which is the traditional sight where Christ was born. Later that day, we went over to the Apartheid Wall which is the looming construction that sets the West Bank of Palestine apart from Israel. 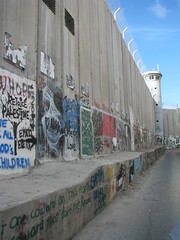 It was a shocking sight for all members of our group looking upon a 10 meter tall concrete barrier that was covered with barbed-wire and spray painted pictures and sayings, speaking out against the Israeli occupation and of hope for the future. Later on that week we went to the town of Hebron where 500-600 Israeli settlers have moved, trying to reclaim “their” land. They are protected by about 2,000 soldiers stationed in Hebron, “minimizing” violence. We walked through the Palestinian part of town hidden out of view from the settlers by walls, segregated streets, and sealed doors. To get to the Tomb of the Patriarch, where Abraham, Sarah, Isaac, Rebekah, Jacob and Leah are all buried we had to walk through checkpoints that the Israelis have set up to keep the settlers “safe” from the Palestinians. We were able to go into the mosque which held the tombs of Isaac and Rebekah, and the center portion that holds Abraham and Sarah’s tombs. However, we were not able to view the tombs of Jacob and Leah as their tombs are in the synagogue and we were there on Shabbat, and were not allowed in. 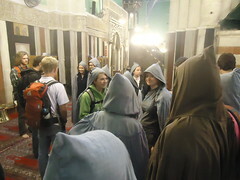 We were also able to walk through the suq, or market, in Hebron as well as view a qiffeya factory and glass blowing. This past week was filled with Arabic lessons, lectures on Palestinian culture and history, falafel, and discussions about all that we are seeing and learning. We have been enjoying exploring Beit Sahour, and getting to know all the wonderful people who reside here. We have also been fortunate enough to be able to see 314 feral cats, 4 burning dumpsters, 1 quite relentless and adamant street vendor, 2 objects thrown at members of the groups by small children, 3 different marriage proposals by the same man, 21 plus hours of Turkish soap operas, and an uncountable number of churches dedicated to Saint George. (Apparently, slaying a dragon gets you a lot of fame). The first day when we here in the Shepherd’s Caves, we sang ‘Oh little Town of Bethlehem’ and Linford shared with us some reflections on the words of that song about how the hopes and fears of the world are meeting in Bethlehem. This song has new meaning to us all now, as we have been able to see the places and context for which it was written. We have seen many aspects of this part of the world that are fears for many people, including us, but we have also been able to see many hopes in the people here, the future, and ourselves. Eight hours ahead of our home in Harrisonburg VA, we are all together on a Sunday night after enjoying a worship service together as a group. This is not an easy task to summarize what we’ve done so far. In the past week, we have been all over the Hashemite Kingdom of Jordan and experienced so many things and learned so much history, it is nearly impossible to write about it all. Day 1: We met our beloved tour guide Mohammad and we took our first bus trip as a group. We saw the River Jabbok where Jacob wrestled an angel. Then we travelled on to the ancient city of Jerash and explored the ruins, sang on an ancient Roman stage, walked through Hadrian’s Gate and visited Artemis’ temple and Zeus’ temple. Then we got back on the bus and travelled to Ajlun Castle, where we learned about Saladin and his defense of Jordan. 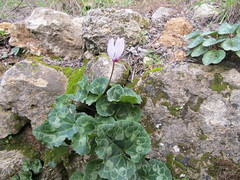 Day 2: We travelled down King’s Road to Shobak Castle. However, Mohammad insisted we take a detour and view Arnon Valley, also known as the “Grand Canyon of Jordan.” The view was well worth the detour. When we got back on the bus and finally reached the road leading up to Shobak Castle, the road was too snowy and icy for the bus to make it. Instead, we hopped out and enjoyed a snowball fight. After that, we made our way to Little Petra and explored the ancient catacombs and amazing view Little Petra had to offer. Day 3: We explored Petra, a bigger version of Petra. We learned about Nabateans and enjoyed a very long hike with an amazing view. 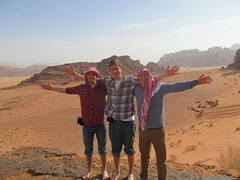 We then travelled to Wadi Rum to stay overnight in a Bedouin Camp. Day 4: Man, do the Bedouins know how to have a good time! We enjoyed such good food and hospitality, with specialty dishes like “magluba” and “zareb.” We also enjoyed a long camel ride through the desert. Day 5: We left the Bedouins and travelled to Aqaba to swim in the Red Sea. Day 6: We came back to Amman. On the long journey back, we enjoyed a stop at Lot’s Cave and a very nice view of the Dead Sea. The very first site that our group visited was the Jabbok River, where Jacob wrestled with an angel before going off to meet with his slightly pissed off brother, Esau, whom Jacob had cheated out of his inheritance. As we all stood and looked out over Jabbok, leader Linford Stutzman read the story of Jacob aloud. Like Jacob, all of us were uncertain of what would lie in store for us. As Jacob left the land, home, and comforts he knew and embarked on his journey, he must have been worried and full of doubt, as many of us on this trip currently are as well. But, the part that resounds prominently is Jacob overcoming, wrestling with God, and wading through the Jabbock and starting his uncertain journey. This week, our group has been thinking about what it means to have faith in the face of such uncertainty. We wrestled with the idea that believers are meant to be travelers; uncertainty is a part of this life and faith a necessity.